Night Vision Security Camera- Do You Need One? Port Forwarding and the Importance For Your Security Systems. If you’ve never heard of access control or are just looking into it, now is a great time to do so, as it is at its peak in the market. The term access control covers a pretty wide range of devices with a variety of functions. It is especially secure security. An access control allows only those who you, the company or business owner in to wherever the lock may be. That being said, you are, indeed, controlling access. With all the news on complete security disruption going on through the world, it is important to not only consider the safety of your customers, but if your customers don’t necessarily spend time wherever you may work, it is equally imperative to consider the safety of those who are working for you to help build your company to the quality facility it has become today. Access control can do this. At the facility in which I work, not only do we on occasion have both dealers and people seeking to purchase our goods coming within our building, but there are so many of us here laying down the inner workings of the company. Everyday each of us comes in, we use the devices on our keychains to enter the building, it immediately locking behind us. This is exceptionally improved to the typical lock and key, and specifically to that point, unpickable! Thanks to our fantastic implementation of access control, employees do not have to turn around and lock the door behind them, as it is smart enough to do so on its own. We feel safe, secure, and as high tech as the very products we offer, because it’s what we offer. Not only is this extremely fortunate to have for us, but it is extremely fortunate for you, the customer as well. 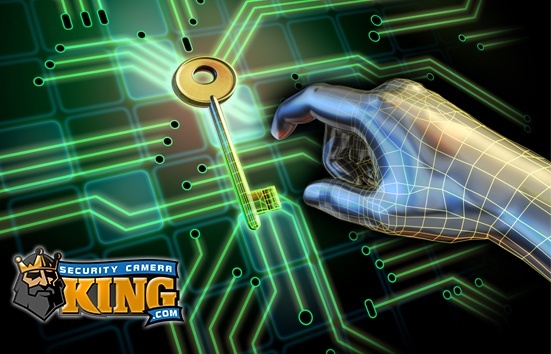 This is because we at Security Camera King offer fantastic tech support that installed this within our compound, and have the knowledge and experience that will allow you to place access within your own. Not only can you offer quality access control to your own workers, and not only is that an enormous benefit, but you may also offer it to others and guard their level of access to your building through the application of access control. It is able to support a variety of time sensitive limits, such as when you would like to provide someone with access control. For example, say you have a mammoth, expansive facility that covers acres of land, or even further, you are a city that operates multiple different departments all over the area and each of those particular facilities have different hours of operation. Don’t think you have to go with the archaic use of the lock and key. No, you are now able to take a control and schedule each of those places to open at any hour, any minute of the day, as well as provide your employees separate access to the access control in order for them to get in a couple hours, or any hours in reality, earlier. This is excellent for large corporations, cities, schools, businesses, and really anything else that needs a lock and key. If you have multiple vendors that have been with your customers for an expansive period of time, then no worry- provide them with an access that is monitored in a different manner if they require entrance. Even if you only have one room or department in your business or facility that needs special control, access control is able to offer this. Install your access control to only that room, whether it may be the room of a remotely viewing security guard, the main power system room, or simply an office where secure information is spoken of, access control is an excellent option. Magnetic Locks: These are fantastic, and pretty cool actually. We’re all probably familiar with those large boxes atop even larger door, that are on the sort of ball and axle system found in pretty much every school. This looks like one of those, with a modern twist on a door lock. An extremely powerful magnet holds the door closed, of course unless one of your access control holding employees comes by to release the magnet with keypad or card. Gate Locks: We at Security Camera King offer a couple gate locks for your yard that needs protection. From large lots to even residential homes, an access control gate lock may be exactly what you need. I know a small business that runs out of their own home, and in order to keep their tools and supplies in their backyard safely kept away, they purchased an access control gate lock for their little wooden gate. Though not a large business, the access control gate lock just adds a little bit of extra peace of mind to know everything is under extra protection. An access control plus a few security cameras really adds a great amount of security for even the small business owner! Cards: Take a gander at our access control cards, compatible with any of our access control readers. Just give it a tap, and there opens your access control! Access control may be the answer to your security solutions, no matter if you’re a large or small business, run out of an enormous warehouse or your own backyard, or just have something you’d like a little extra security on, it may be the choice for you!